Piano accompaniment for all instruments, ensembles and choirs. Specialising in exams, competitions, eisteddfods, recordings and concerts. Derek Moule is happy to provide a no-obligation quote for his performance. 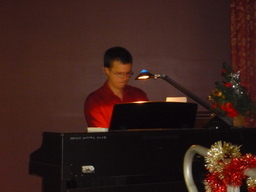 Derek Moule obtained his AMusA diploma on piano in 1998. He first began providing accompaniment for AMEB exams 15 years ago. Since then he has accompanied a large number of musicians and music students for AMEB and Trinity exams, university exams, eisteddfods, brass band solo events, choir competitions and concerts. Accompaniment provided throughout Port Macquarie and the surrounding region.